Here are some words that few would have thought to put together: video game therapy. Yet, a pilot study by vision researchers at the University of California, Berkeley, has found that playing video games can help improve the vision of adults with amblyopia, or lazy eye. The study found that participants experienced marked improvement in visual acuity and 3-D depth perception after spending just 40 hours playing off-the-shelf video games. 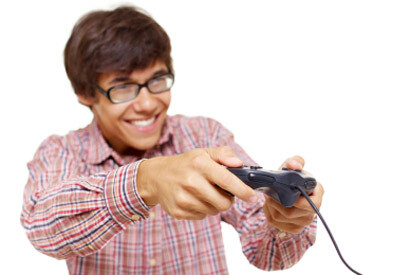 A UC Berkeley pilot study suggests that video games could help treat adults with amblyopia. For those who might use these findings to argue for more game time, note that no studies have shown similar benefits for people with normal vision. The study is published in the August 2011 issue of the journal PLoS Biology and is freely available online. Amblyopia, a brain disorder in which the vision in one eye does not develop properly, is the most frequent cause of permanent visual impairment in childhood, affecting two to three of every 100 children, according to the National Eye Institute (NEI). It is also the most common cause of one-eye visual impairment among young and middle-aged adults. While amblyopia in children can be successfully treated through occlusion therapy – putting a patch over the “good eye” to force the brain to use the weaker “lazy eye” – few options are available for adults with this condition. But recent studies on perceptual learning, including those authored by Levi and Li, have dispelled the notion that no vision improvements are possible in adult amblyopes. They found that intensive training on a perceptual task, such as getting two horizontal lines aligned, could lead to a 30-40 percent improvement in visual acuity. The researchers wanted to see if playing a video game, with its richer variety of stimuli, could lead to the same visual improvements for amblyopes that were seen with the more mundane visual tasks. In the new study, which was funded by the NEI, the researchers used an action video game, which required subjects to shoot at targets, as well as a non-action game, which required users to construct something. There were a total of 20 subjects with amblyopia, ages 15 to 61, in the study. In the first experiment, 10 participants played the action video game for a total of 40 hours, two hours at a time, over the course of a month. In a second experiment, three other participants played the non-action video game for the same amount of time. While they were playing video games, participants wore a patch over their good eye. Both experiments yielded a 30 percent increase in visual acuity, or an average improvement of 1.5 lines on the standard letter chart used by optometrists. In comparison, it can take 120 hours of occlusion therapy to see a one-line improvement on the letter chart in children with amblyopia, the authors said. Performance was measured after every 10 hours of gaming, the researchers noted, and some subjects started improving earlier than 40 hours. To verify that the results were specific to video game playing and not due to the use of the eye patch, the researchers conducted a third experiment in which seven participants wore a patch over their good eye for 20 hours during their normal daily activities, such as watching television, reading books and surfing the Internet. At the end of the 20 hours, they showed no improvement on the vision tests. Those same subjects were then asked to wear a patch while playing video games for 40 hours, and when tested, showed the same level of improvement as the other study participants. Among the 20 study participants, half had strabismic amblyopia, marked by misaligned or crossed eyes. Six had anisometropic amblyopia, in which the two eyes have significantly different prescriptions. Another three had both conditions, and one subject had amblyopia caused by cataracts in one eye. The study found no significant difference in visual acuity improvement among the different types of amblyopia. However, anisometropic subjects also saw a 50 percent improvement in 3-D depth perception after 40 hours of playing video games. Li also cautioned that the research on video game therapy for amblyopia is still in its early stages, and that patients should not attempt to “self-treat” their amblyopia. “People definitely need to work with their eye doctors,” he said. The results of this pilot study are so encouraging that Levi received a three-year, $1.7 million NEI grant to compare video game therapy with the use of patches to treat amblyopia in children and adults in a randomized clinical trial. For that study, which will be conducted in collaboration with researchers at the University of Rochester and the Rochester Institute of Technology in New York, the researchers will use customized video games that are non-violent and child-friendly. “We didn’t think it was a good idea to have a 5-year-old blowing things up,” said Levi.